When the Culture, Media and Sport Committee launched its inquiry into the governance of professional football in December, the need to address the ‘concerns’ of fans was cited as a major reason. The coalition government had agreed to encourage reform “to support the co-operative ownership of football clubs by supporters” and examine “the scope for enhancing supporter involvement in decision-making processes”. This is an ongoing issue in the English game and has surfaced again this week with the news that Stan Kroenke has increased his shareholding at Arsenal, triggering a debate about the rights and wrongs of foreign owners and profiteering stakeholders. Of course, within the legal frameworks in place in Britain, owners are free to buy and sell clubs, free to leverage their buyouts and free to use club assets for personal gain. Many fans understandably think that is wrong and want substantive change. Only structural change will alter anything. 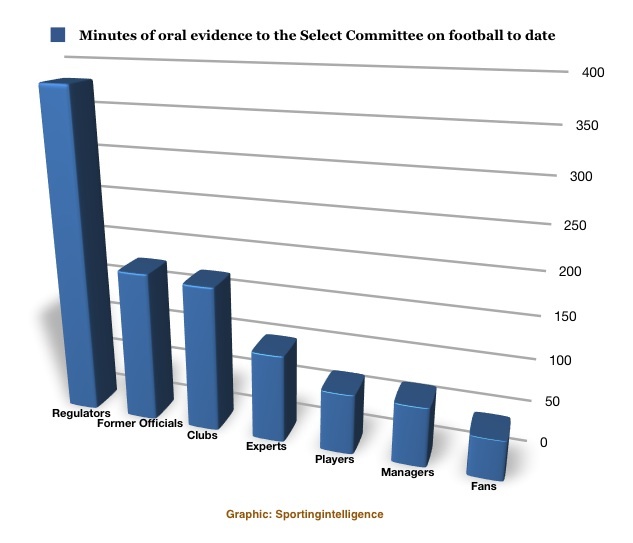 Yet so far, during seven Select Committee hearings sessions between 8 February and 5 April, fans’ views have been allotted just five per cent of the available time so far, according to a detailed analysis by sportingintelligence of the sessions and evidence to date. To be precise fans’ representatives have been heard for 47 minutes of 1,025 minutes of hearings staged variously in the House of Commons (five times), at Burnley FC (once) and at Wembley Stadium (once). Not only that, but the fans’ views were expressed in one of the only sessions not to be streamed live, and they were heard by the fewest number of MPs (five) attending any of the Select Committee hearings to date. As our graph below shows, the rest of the time so far has been spent hearing from regulators (381 minutes, 37 per cent of the time allowed), former officials (179 minutes, 17 per cent), clubs (173 minutes, 17 per cent), experts (including academics and a journalist, 104 minutes, 10 per cent), players (via the PFA, 71 minutes, seven per cent) and managers (70 minutes, seven per cent). Below the graph we detail who gave evidence, where and when, and for how long, and into which category they fell, including links to transcripts. Separately, the inquiry requested written submissions from interested parties and there have been 92 submissions so far, many of them from fans, supporters groups and trusts, and other grass roots stakeholders, as well as various leagues and errm, the Lawn Tennis Association. The submissions can be seen in full here. Sportingintelligence is in the process of analysing more precisely the content of these submissions, and we have also asked the Select Committee which MPs have read these submissions, and how many, or indeed whether any of the MPs have read them all, or any at all. We have also asked what weight these submissions will carry. Anecdotal evidence suggests that most of the MPs have yet to read most if any of the written submissions, although as and when that can be clarified we will update this article. Oral evidence to the select committee by . . .